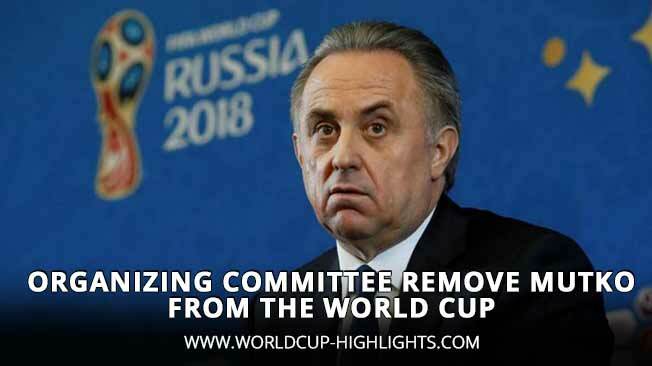 Russian Deputy Prime Minister for Sports Mutko already exclude from the supervisory board of the organizing committee "Russia-2018" - an organization that prepares for the World Cup. The document on the exclusion sign by Prime Minister Dmitry Medvedev. Mutko was the head of the organizing committee - this post is take by the organization's general director Alexei Sorokin. Mutko, Vice Prime Minister of the Russian Government for Sports, Tourism and Youth Policy, lost one of the three posts he had during the last year - the post of head of the organizing committee "Russia-2018", which is preparing the upcoming World Cup. that the official is going to resign in the organizing committee of the mundialya, it became known as early as December 27, 2017, but the documents sign on January 4, 2018. The order to exclude Mutko from the supervisory board of the organizing committee "Russia-2018" is sign by Russian Prime Minister Dmitry Medvedev. Instead, the general director Alexei Sorokin choose the chairman of it's organization, who will now combine the two posts at once. "Sorokin will interact with the International Football Federation (FIFA). I will also coordinate the work of the government. Sorokin will receive all the necessary support from the state as head of the organizing committee. The World Cup project is in a high degree of readiness, a lot things already settle up. And the tasks that we have not yet solved in the outgoing year will complete soon, "Mutko promised in a TASS commentary. Sorokin himself assured that he would not experience big difficulties with combining posts. "In fact, the management of the organizing committee will not undergo any major changes. We regret these changes, but everything will continue in the working mode, and Leontievich will continue to supervise the training as vice-premier. I am ready to combine posts, there are no big difficulties, the project is almost done, there are operational activities where the functions of the chairman and the general director of the organizing committee will be similar, "the official said. FIFA appreciated Mutko's voluntary withdrawal from office. "FIFA understands Mutko's decision, which was also adopted in the interests of the 2018 World Cup in Russia. FIFA thanks him for such a responsible step and the work done so far to prepare for the World Cup, "the organization said. According to the vice-premier, he decided to leave the Organizing Committee in connection with the sanctions imposed by the International Olympic Committee (IOC), , for life suspension from the Olympics. This verdict is make by the IOC Executive Committee on December 5 - at the same time, when the entire Russian national team was not allowed before the 2018 Winter Olympics in South Korean Pyeongchang due to alleged doping violations. IOC considered that Mutko could also have something to do with the machinations with the samples during the Games-2014. "I can not agree with what is being said about the 2014 Winter Olympics in Sochi. So I made a decision that I would file an action with the Sports Arbitration Court (CAS) to challenge the decision about my suspension from the Olympics. I can not substitute a doping test in any way, so my accusations are unfound, "Mutko said. The official has already appealed to the CAS, and while the proceedings are ongoing, he intends to focus on public work. Earlier, on December 25, Mutko left another post - the president of the Russian Football Union (RFU). But, this departure, unlike the exception from the organizing committee "Russia-2018", will be temporary - only for six months. At the same time, the presidential mandate, which the deputy prime minister won, having won the election of the head of the RFU in September 2016, will remain in force. substitute Mutko is the company's CEO Alexander Alaev, who immediately announced that he was waiting for his predecessor to return as soon as possible. "Exactly two years ago we did not talk about football, but talked about the need to save the organization, and, in fact, Vitaliy Leontievich did it," stressed Alayev. - Today we all need to concentrate, we have full contact with clubs and federations - this is a football family. I hope that the suspension will be reduce, because Leontievich is the best in football, we will miss him. We must do everything to ensure that all our teams perform well, and I will do my best for this. "